While I was in Europe, we stayed at a few hostels that served free breakfast...consisting mostly of strore bought bread with sugary spreads. I could never take advantage, and it sucked. However, in France, we stayed a couple of nights at a hostel that served something I could actually eat—muesli. They even included the list of ingredients—how thoughtful. I don't know if it was the relief of having my breakfast already thought out for me, or getting something for free, but I became obsessed. I craved muesli for the rest of the trip, and it was the first thing I ate when I got home. I make and eat muesli every day. I prepare individual portions each morning because I enjoy the ritual and read that chopped nuts lose freshness very quickly. I follow the basic formula of oats, nuts and dried fruit, and add a little maple syrup and milk for sweetness. I don't usually let my cereal soak too long—maybe 20 minutes, though many sources say it is best to soak the oats overnight, to help break down their outer coating and aid digestion, but I prefer the taste and texture of a less soaked oat. 1. 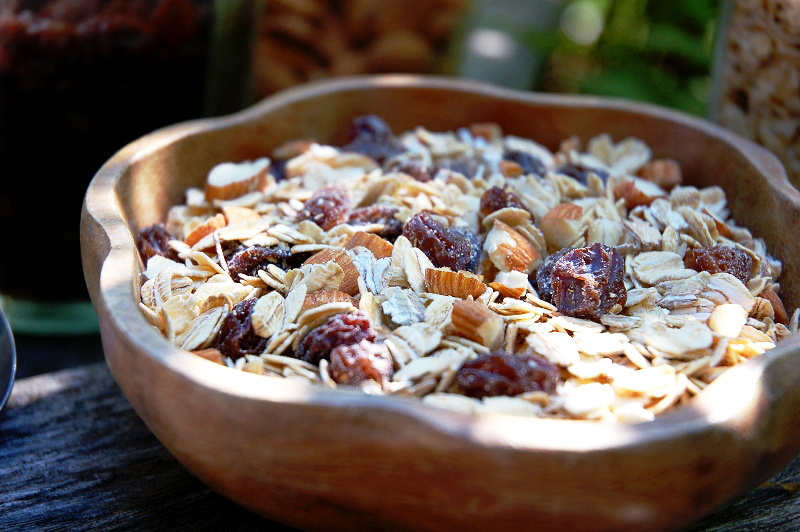 Combine the grains and nuts, then add the raisins, ensuring they don't clump together. 2. Add maple syrup and milk. Either let soak, or enjoy right away. *The quality of oats makes such a difference...I have happily used organic, Quaker and Bulk Barn oats, but right now I'm suffering through a bag of chewy no name brand oats...pooh. Oops, this post passed me by! I do love muesli, but I only have the poopy no name oats you just complained about. Do you ever toast your muesli in the oven before eating it? Also, I like your bowl. A lot.